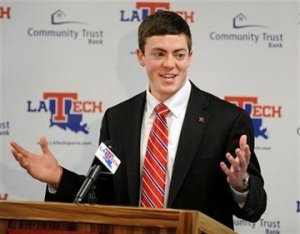 Well head coach of Louisiana Tech’s women’s basketball team, Tyler Summitt, apparently skipped over that part of his contract. The school reported that Summitt resigned from the LA Tech basketball program after relations with one of his players resulted in a pregnancy. The 25 year old, now ex-coach, announced his resignation Thursday stating, “I am profoundly disappointed in myself for engaging in a relationship that has negatively affected the people I love, respect and care about the most.” Included in those “people he loves” is Summitt’s wife of 3 years, Ande Ragsdale. Yup, I said wife. Summitt’s infidelity not only tarnished his wedding vows, but also any chances of him coaching elsewhere. Do you think Summitt’s age played a major role in his decision making? Should age limits be considered for coaching positions of this caliber?